It has been said that the journey is as important as the destination. I have always agreed with this and was settling into this mode on the train journey between Ipswich & Leeds, culminating in 2 pints of Old Rosie in Leeds and a can of Stella on the train FROM Leeds to Manchester. Unfortunately (number 1), this train arrived 10 minutes late in to Manchester Piccadilly resulting in me missing the connection to Oxenholme which had left 4 minutes earlier from the same platform. The next train was not due for another 2 hours, but no problem as can still get the bus from Windermere to Keswick at 18:15. Time to relax again, especially as the next train did not involve a change at Oxenholme. It split in two at Lancaster with the front 3 carriages continuing to Edinburgh and the last 3 (where I was) branching to Windermere. Unfortunately (number 2), leaving Oxenholme at 17:50 made me realise I was going to miss the 18:15 from Windermere with the next bus not getting me into Keswick until after 21:00. This would mean it would be after 22:00 before I arrived at Buttermere resulting in me not getting rested in time to set off early next day on the first day of my walk from Buttermere to Coniston. Between Oxenholme and Kendal I formulated a plan to get off at Staveley , catch taxi to Kentmere and do Kentmere Horseshoe and Sledale Fells on first two days rather than the last two days. Unfortunately (number 3), these 2 walks were planned as a contingency to do if I managed the Buttermere-Coniston walk in 5 days. Doing them first meant I had no contingency in the 5 day walk. Not a problem I will not need contingency!!! Unfortunately (number 4), there are no taxis at Staveley station, they have to come from Windsermere. Not to worry I thought it is only 6 grid squares away (4 miles) [just over]. After strapping the Nike shoulder bag to my back pack I set off for Kentmere via the Spar shop for milk - just managing to avoid clearing all of the shelves on the way to the milk with my back pack. I arrive in Kentmere just under 2 hours later hot sweaty and tired, thinking I would not want to have done much further. Then remembered the Nike bag of extras on top of the 58lbs back pack weight was 12lbs. What 70lbs no wonder I am knackered? Like they say the journey is as big a part of the trip as the destination, unfortunately (number 5), the journey was not as expected and although I did end up at a destination it was not the original one planned. I woke up early next morning, feeling a little stiff in spite of all the gym training I had done to prepare for this week, whilst eating breakfast it occurred to me if I spent 2 days walking from Kentmere, it would take a day to get to Buttermere, leaving me only 4 days to complete the planned walk. 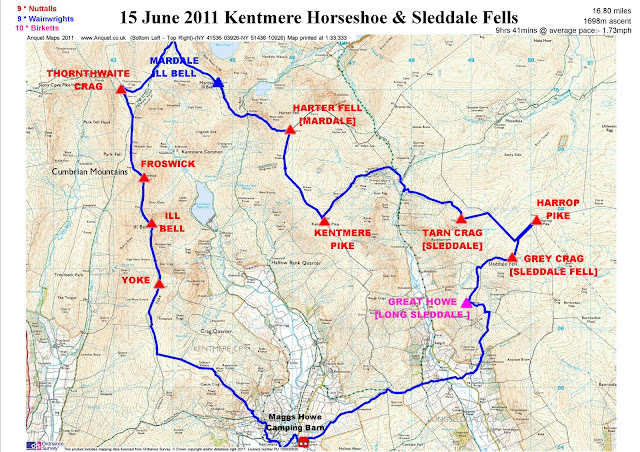 I then have a plan to do Kentmere Horseshoe and Sledale Fells today, rather than over two days, spending tomorrow getting to Buttermere, which would include the 4 mile walk back to Staveley. A quick re-plan and laving a list of my route with barn owner, I was all ready for the off by 09:00. After the clear blue skies of yesterday it was raining this morning. Not heavily but what I call wet rain - a steady fine drizzle. I took the bridle way from Green Quarter to join the pass between Stile End and Tills Hole Lane. I had walked this path before on an earlier visit when I bagged Hollow Moor and Cocklaw End, but I still had a job to find my way out of the farm. Anyway once underway all of my stiffness disappeared and the going was much easier with my new found fitness and lack of a 70lb pack. All I had was some dry clothes, water and some high protein snacky things in a bag for life stuffed inside my Nike shoulder bag. No more than 8lbs including water. After 45mins I had covered just over 2 miles and was walking past Stockdale Outdoor Pursuit Centre. A decent pace despite the rain. From here was the first part of real ascent to Sledale Fell. Navigation was fairly straight forward simply following a wall north after Brow Gill. Just as well since with the ascent cloud had closed in reducing visibility to about 75m as well as the rain. I had not intended to bother with the Birkett, Great Howe, but when I saw the pillar off to my left at the top of a loose rock scramble I thought why not. The top was beyond the pillar but from there it was a case of following the ridge north to join Galeforth Gill until it crossed a wall running east west and continuing along the Gill until it went round the rocky screes marked on OS explorer map. However from the wall corner there was a footpath on the ground heading NW from the wall corner which I guessed was the preferred route of previous walkers to Sledale Fell top. I therefore chose to follow this path keeping a careful eye on my compass maintaining a 40° - 50° baring initially then 90° which I was happy to follow on the basis that I was continuing to climb. All of this was done in decreasing visibility as I ascended and was well pleased the path though sometimes difficult to follow led me straight to the cairn which marked the top. Visibility was not improving so again I headed off on a 10° bearing expecting to hit the wall after about 400 paces. This part was really boggy with a couple of deep groughs that dropped into more bog forcing me to box round them where I could but as usual the boggy ground stopped me walking in a direct line. I was therefore well pleased when I hit the wall just east of the turn making navigation dead easy by following the wall on the south side over a fence and continue until the fence turned where I should find the next top of Harrop Pike. I love it when a plan comes together and I am confident of y exact location. The top was marked by a tall cairn built on a rock on the north side of the fence. Onwards to the next top of Tan Crag, again this should be straight forward following the same fence back on the north side this time to ensure I did a circular walk. As the wall turned NW the ground got boggy and it became more difficult to follow the wall exactly. This was not a problem all I had to do was keep it in site on my left until it took another kink slightly further west. As I reached the kink I noticed a well marked path heading west and I opted to follow this knowing that if it continued west I would fin Tarn Crag top. In a short space of time I came across a cairn which I mistakenly thought was the top. Progressing beyond this the ground continued to rise and rather spookily I could see a shadowy shape in the mist which at first I thought was a person and turned out to be a pillar over 10feet high. It had a slot in the top and bar across the top which I guess was something to do with the areas mining past. It was past midday and after taking a few photos broke out my oat biscuits and pro-flapjack protein bar. By the time I had finished eating these shading from the wind behind the pillar it occurred to me the conditions were quite wintry and that I was starting to feel chilly, prompting me to put on an extra layer. Visibility by now was less than 50m so i headed on a 315° compass bearing with the wind at my side. I expected to find a wall after about 400 paces, but after 500 paces there was still no wall and visibility was still no better than 50m. Consultation of the compass did not seem to correlate with the lie of the land and the contours on the map and I began to have a feeling of déjà vue that I had wondered off in the wrong direction. I thought if I head north I will hit a wall at some point and within a dozen paces I caught sight of a post through the mist on my left. Changing direction and heading downhill for this I joined the wall near a junction which was part of the wall that formed a Y leading down to Brownhowe Bottom and the Gatesgarth Pass. Once again I knew where I was and as I descended quickly following the wall the path leading to the Gatesgarth Pass came clearly into view. By the time I reached the bottom the rain had stopped and the cloud cleared behind me giving me a clear view of the Fell behind me although I had descended too low to see its top. Renewed confidence flooded back and I took care not to get over confident, but from here it was a short ascent then turn left through the old Wrengill Quarry workings and follow yet another wall to Kentmere Pike. ½ way up I met a dog that had done 3 rounds of all the Wainwrights. I also found out his owner who was with him had done 7. After this the climb steepened requiring me to rest just short of the crest. At the top I turned left and followed the wall to the cairn marking the top of Kentmere Pike. The cairn is on the west side of the wall, but I reckon the highest point is actually at the base of the wall, with the top of the wall being the highest point. It was studying this I noticed the trig point on the other side, so I climbed over the wall using the built in steps to photograph the trig point and ensuring I climbed the highest point.